Neil Hindle describes how one school’s innovative practice achieved a key aspiration for Sleuth. We have worked with Streetly Academy since 2010 and with the headteacher Billy Downie for a while longer. Billy had introduced Sleuth in his three previous schools, firstly as a Head of Year, then Assistant Head, then Deputy Head and most recently soon after taking on his first headship at Streetly Academy. At that time Sleuth was already well established in UK schools and widely used as a tool for tracking behaviour, usually with the primary objective to reduce the less desirable behaviours of pupils. Even if a school’s primary objective is to reduce negative behaviour, we believe this can be achieved more quickly and sustainably through consistent recognition of positive behaviour. However, in our experience working with schools, systems for positive recognition are often much less developed than those for dealing with negative behaviour. We hoped to have some influence over changing that by encouraging more schools to try it. As education professionals and having worked with hundreds of schools on Sleuth projects we knew that changing established working practices in schools countrywide was a long-term project, likened by some to pushing water uphill. What we needed was more evidence of successful practice for others to follow, or a lot of buckets. It was something of a eureka moment when we learned of Streetly’s PRIDE initiative and how they planned to use Sleuth to measure its impact and to monitor their own progress in embedding their PRIDE values throughout the school community. Like a lot of good recipes, PRIDE uses the best ingredients from other established recipes to create something new and different: attitude and character traits from the Olympic Values, social and emotional skills from SEAL, learning skills from PLTS and aspects of SMSC development, all hand-picked so that PRIDE was personal to Streetly. It was researched, well planned and cleverly presented so it was obvious that some pupils would engage with it, but would all the year groups engage and all the staff, and not just for the short-term but sustain that engagement over a longer period? Lots of schools have a set of core values, some developed more in hope than expectation that pupils will identify with them; very few are actually able to demonstrate that those values are shared by the whole school community and are well and truly embedded in school life in the way that PRIDE is at Streetly. The evidence is in Sleuth; on a daily basis PRIDE has an impact on every staff member in every department, with every pupil across every year group. Pupils know what the school’s values are and they know they will be recognised by staff for demonstrating those values, in and out of lessons. In the first two terms of 2016-17, over 95% (1362) of pupils have been recognised at least ten times for one or more of the PRIDE values. With over 1400 pupils that is a significant whole school impact. 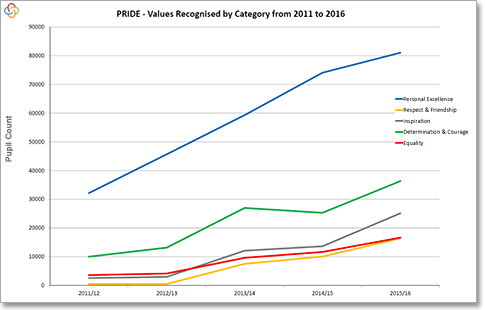 In fact, PRIDE hasn’t just made a difference over a term or two, in each of the last five academic years, for all year groups (including years 10, 11, 12 and 13) in every PRIDE category, the number of pupils recognised for those values has increased. So, year after year PRIDE is engaging and motivating pupils at Streetly, and beyond. It’s clear that we are not the only ones looking for an effective and sustainable model to promote positive behaviours. When we published our first case study about PRIDE, around two thousand copies were downloaded, we took 1200 copies to The Education Show and ran out. That interest has also spread worldwide, we have spoken with schools in Australia, USA and the Middle East about PRIDE. We have used the PRIDE model in hundreds of demonstrations of Sleuth as an example of outstanding practice. PRIDE dispels the myth that some groups of pupils will never engage and that staff don’t have time to routinely recognise and acknowledge pupils’ personal development. They do and they have; because they know the outcomes are overwhelmingly positive. “Since we started using Sleuth we’ve seen year on year, month on month improvement in behaviour. For us, Sleuth is a triangulated monitoring system, it tracks our positive behaviours, manages our negative behaviours and supports our school values, the PRIDE values. Those values are evident in everything that we do. 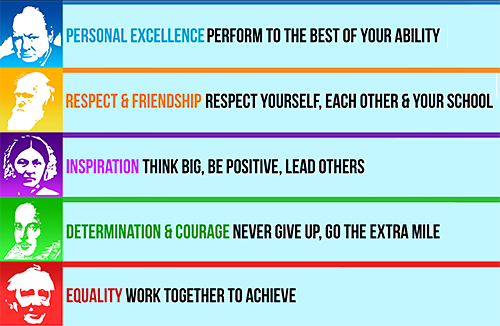 Those values deliver achievement. PRIDE has been widely shared with other schools, many adapting Streetly’s PRIDE model and adding their own ingredients to suit their own vision, values and ethos. Streetly themselves have updated the PRIDE model a number of times to recognise different values, in response to pupil voice and driven by a desire for continual improvement. The vast majority of the schools we work with, mainstream and special, are now using Sleuth to recognise positive behaviour, personal development and social skills. For some schools, a reduction in negative behaviour was their intended destination, but by taking a positive approach they have achieved significantly better outcomes on the way. Neil Hindle is a co-founder, owner and director of the School Software Company. This is an updated extract of a submission for the Department for Education Character Awards.